Upscale dining in Branson is an exciting activity to enjoy as many of the finest restaurants in the area offer high quality menu and an ultimate dining experience. Branson visitors always have their preferences in dining, whether they choose to eat in an upscale restaurants or in an inexpensive eatery, they can always enjoy a dining experience they way they want. And if you want to enjoy an unforgettable dining experience in Branson, be sure to dine at some of the top 3 upscale restaurants such as the Farmhouse Restaurant, Grand Country Buffet Restaurant, and Branson Cafe. Farmhouse Restaurant is an upscale restaurant in Branson that offers savory, hearty meals that taste like they come straight out of grandma’s kitchen. This small town dining spot boasts an intimate and welcoming atmosphere with friendly servers who make sure you enjoy your time. To enjoy a great dining experience in this cozy restaurant, don’t miss their signature dishes that include lightly breaded catfish, fried chicken or homemade blackberry cobbler with traditional sides like red skin mashed potatoes, cinnamon apples, sweet potato fries, fried okra and more. This cozy restaurant is a favorite place for tourists and locals alike who want to experience home-style cooking. Grand Country Resort offers an array of convenient on-site restaurants serving delicious cuisines. One of them is the Grand Country Buffet which offers bountiful breakfast complete with fresh fruits, homemade breads, cereals, yogurt, farm fresh eggs, sausage, bacon, potatoes and more. This upscale restaurant assures that all appetites and diet needs are fully satisfied from the light to the traditional breakfast from their cold and hot scatter bar buffets. At Grand Country Buffet, you’ll enjoy a luscious lunch. For on-the-go customers, don’t miss the scatter bar which features mouth watering selections of meats, salads, vegetables, fruits, bakery fresh breads and desserts from the no-lines, hot and cold food bars. 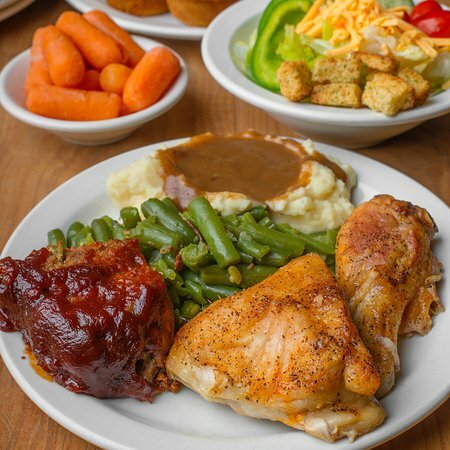 When you dine at Grand Country Buffet, you can feel an experience reminiscent of dinner at Grandma’s house, a perfect ending of a full day of fun in Branson. In this buffet restaurant, you’ll get to enjoy their slow-roasted, succulent roast and ham, hand carved for you as you fill your plate from the vast selection of five food bars. Branson Café is another upscale restaurant in Branson located in the historic downtown area and beautifully surrounded by quaint shops and theaters. Established in 1910, Branson Café has been serving up delicious, homestyle meals more than a century ago. This is the restaurant that offers comfort food like chicken fried steak, pot roast and meatloaf or breakfast favorites like biscuits and gravy, omelettes, pancakes and hash browns. For guests who long for sweet treats, the Branson Café offers fresh baked goods like pies and giant cinnamon rolls. The friendly service and affordable prices make this restaurant more likeable to eat and its small town charm keeps both locals and tourists coming back for more. When you dine at some of the upscale restaurants in Branson, you’re sure to enjoy a delicious food that will truly satisfy your appetite.